A brushed satin 8mm wide hammered wedding band ring made in pure .925 sterling silver. The band is available for men or women, based on the ring size. 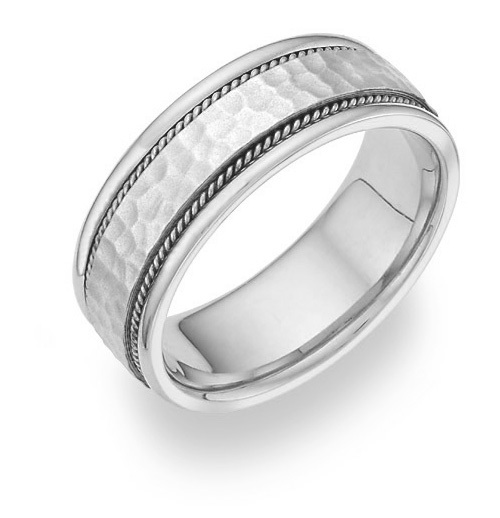 The center brushed finish band is hammered, while the outside silver band remains a high-polished finish to create contrast between the hammered design. This band is also available in 14k white gold or two-tone gold, shown below. We guarantee our Sterling Silver Brushed Hammered Wedding Band Ring to be high quality, authentic jewelry, as described above.